Do You Wish You Knew Better Grammar? Wish You Knew Better Grammar? Her mother wishes they would get married. I wish I had brought my camera. I wish to speak to the president. You will often hear wish in music, movie dialog, poetry and inspirational speeches. Let’s take a look at some of the tricky grammar issues with wish. A wish is a desire for a different reality. In general, wishes express desires that are unlikely to happen. If you say, “I wish I could fly,” it means you probably will not grow wings and learn to fly. Wish follows a unique -- and rather confusing -- set of grammar rules. Wish uses the same verb back shifting rule as reported speech. A wish about the present uses a simple past main verb. He wishes he understood the lesson. In this example, understood is a simple past verb. I wish that I looked like a movie star. I wish I looked like a movie star. Both of these sentences have the same meaning. In hypothetical situations, such as wishes and conditionals, use were for all pronouns. I wish she were here. In everyday conversation, you might hear was after wish. For example, “I wish I was the president.” Was is acceptable in informal situations, but you should use were in formal situations. This confusing rule comes to English through Latin. I wish you would finish college before you get married. Someday, you are going to wish you had taken my advice. When you are older, you will wish that you had studied engineering. Let’s take a closer look at past wishes. Generally, a past wish is a wish that did not come true. To refer to a past wish, use a past perfect verb after the object. 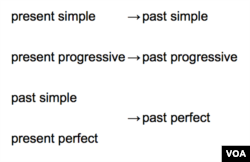 To form the past perfect, use had followed by a past participle verb. She wishes she had written down the phone number. I wish I had known that you were in town last week. Listen to country singer Gene Autry make a past wish in an old song called “I Wish I Had Never Met Sunshine.” In this song, Sunshine is the name of a lost lover. Most of the time, a wish about the past suggests regret. The speaker would have acted differently if he or she could turn back time. A past wish has a similar grammatical function to a past unreal conditional. Listen to this song by Taylor Swift. You will hear three different uses of wish. She starts with a future wish, then shifts to the past, then to the present. I wish to speak to the manager. I wish to learn the truth about what happened. What’s the difference between hope and wish? In some contexts they can be interchangeable. Hope usually expresses desire that is possible. Wish, on the other hand, refers to an outcome that is not likely to happen. Pay attention to the different contexts of hope and wish in these examples. And that’s Everyday Grammar. We hope you will write to us in the Comments and on our Facebook page. Adam Brock wrote this story for VOA Learning English. Dr. Jill Robbins and Kathleen Struck were the editors. verb back shifting rule – grammatical term. The concept of going back one verb tense. Have You Perfected the Perfect Tenses?